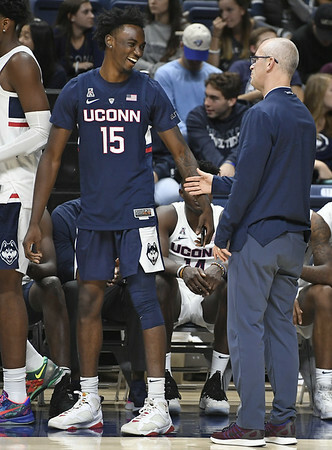 The UConn men’s basketball team will be short-handed when it begins its first season under coach Dan Hurley. UConn forward Sidney Wilson has been suspended from game competition for what the school said was “a violation of university policy that occurred during the 2017-18 season.” That was the now-fired Kevin Ollie’s final season as coach. The school indicated in a release it would have no further comment “until there is a change in Wilson’s status.” It’s not clear how long Wilson’s suspension will last. A redshirt freshman from New York, Wilson did not play for the Huskies last season. Briefly a student at St. John’s, Wilson sat out because of NCAA rules. Both Wilson and senior guard Jalen Adams were held out of the team’s closed-door scrimmage against Harvard on Saturday for what Hurley called on Sunday “a violation of team rules”. It appears that Adams’ and Wilson’s transgressions are separate matters, though a school spokesman would not confirm that. The 6-foot-7, 177-pound Wilson was a standout at Brewster (N.H.) Academy before going to St. John’s. UConn hosts Southern Connecticut State Friday night in Storrs for an exhibition. Former Husky and current Owls coach Scott Burrell will be feted, as the Hamden native joins the Huskies of Honor. UConn’s regular season begins with a game against Morehead State Nov. 8. Posted in New Britain Herald, UConn on Thursday, 1 November 2018 20:56. Updated: Thursday, 1 November 2018 20:58.